Theres a new queen on the scene in Folly Beach. Twenty-year-old Lindsey Lambrakos  daughter of Andrea Weathers and Chris Lambrakos – took over as keeper of the crown at the pageant in North Charleston. She will represent the city of Folly Beach at festivals, pageants and other events throughout the state and region. In November, Lambrakos will compete for the title of Miss South Carolina. In addition to her title as Queen of Folly Beach, Lambrakos is Miss Relay for Life 2010. She is a graduate of First Baptist Church School where she was a cheerleader and member of the Foreign Language Club. She is currently a junior at Clemson University where she is majoring in Parks, Recreation and Tourism Management. She enjoys boating, fishing, traveling and spending time with friends and family. Lambrakos also enjoys volunteering and making appearances with her crown to support local fundraising and awareness events. One of the biggest duties the Queen of Folly Beach must adhere to is civic duty. To win the title, contestants are required to participate in interviews and a swimsuit and evening wear competition. Lambrakos was joined by Teen Queen Bianca Gardner, Teen Queen of Edisto Beach Amber Cohen and Queen of Edisto Beach Brettany Griffin. For the first year in the pageants history, the titles of Junior Teen and Miss Division were added to the Folly Beach pageant. 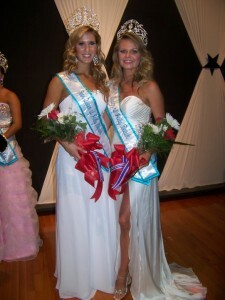 The Jr. Queen of Folly Beach is Madison Oswald and the Miss Division Queen is Brandy Morton. The pageant raised more than $5000 in its first year for local charities and logged more than 1000 volunteer hours for various organizations and schools throughout the state. In addition to the Folly Beach pageant, the titles of Teen Queen and Queen of Edisto Beach were added in recent years, along with Junior Queen and Miss Division. These additions provided the chance for six young women from the two communities to be crowned. Saw the Folly Beach Queens at the Halloween Party at the beach. The kids definitely loved them, but the older people even more. Two beautiful girls.